1 // Glamglow Thirstymud Hydrating Treatment ≫≫ I've wanted to try this hydrating treatment for awhile now, since I always have dry skin, but since we're about to move from a very wet climate and make our way through some dryer states in the heart of Winter...I'm starting to think it's a must! 2 // The Body Shop Body Butter in Peach ≫≫ I am always in search of a good body butter, thanks to my dry skin, and it's even more necessary in the Winter months. On my last trip to Kansas, I made a stop into Ulta and was taking my time browsing the aisles. I honestly have never really gotten the hype for The Body Shop's Body Butters, but when I smelled the peach...I'm obsessed. I'll be grabbing one of these as soon as we get back down south. 3 // Benefit Hoola Bronzer ≫≫ I've owned this bronzer for about a year now and I still love it. A good bronzer is key to Winter makeup and not looking too pale and washed out in pictures. This one is so universal and not glittery, so it can work on a lot of skin types and is great for the Winter months. 4 // Fresh Sugar Lip Treatment SPF 15 in Petal ≫≫ I'm already starting to have issues with my lips being dry (thanks early Alaskan Winter) and my go-to for years has been the Fresh Sugar Lip Treatments. The plain is perfect if you're going to put a lipstick or gloss on top, but I also love it in petal. Healing and beautifying all in one. Perfect. 5 // ALTERNA Bamboo Deep Hydration Masque ≫≫ The dry Winter months can really have a bad impact on hair, so a hydrating mask sounds like something I should probably invest in. Has anyone tried this one by Alterna? The reviews and description sound great, might have to try it soon! 6 // Urban Decay Naked Eyeshadow Palette ≫≫ I have Naked 2 and 3, but not 1 which is pictured. I loooooove 2 and 3, so I might have to invest in this one soon since it has some more Winter type colors. Winter is a great time to go a little darker with your eyeshadows. A little less bronzy golden colors and a little more dark browns and smokey eyes. 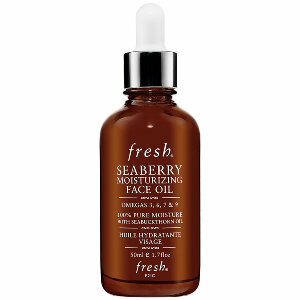 7 // Fresh Seaberry Face Oil ≫≫ I LOVE this stuff! It seems a bit pricey when you buy it, but since you only need a drop or two in the morning and at night, it lasts forever. And since you add it to your daily moisturizer, it helps that last longer too. Win win. 8 // Benefit Rockateur Blush ≫≫ This is another obsession of mine. This blush applies so silky smooth and the color is perfection. And blush is another important item for your Winter look, to help you look alive when you're at your palest. ...What's your beauty must-have for Winter?